For both Republicans and Democrats, the top reason to belong to a party is a belief that its policies will benefit the country. But sizable majorities in both parties cite the other party’s harmful policies as a major factor, according to a new national survey. And for independents who lean toward a party, negative motivations are mentioned most often – by far – as a major reason for their partisan leaning. About three-quarters of Republicans (76%) and 72% of Democrats say a major reason for belonging to their party is that its policies are good for the country, according to the survey of 4,656 U.S. adults conducted Jan. 29-Feb. 13. Republicans (71%) are more likely than Democrats (63%) to cite the harm from the opposing party’s policies as a major reason to affiliate with their party. Fewer cite other considerations as major reasons why they identify with their party. About half of Democrats (51%) and 45% of Republicans cite having a lot in common with other members of their party as a major reason. Roughly a third of Democrats (37%) say a major reason for their affiliation is loyalty – that is, they have been a Democrat for as long as they can remember. Just a quarter of Republicans say the same. And comparable shares of Republicans (37%) and Democrats (36%) say a major reason they identify with their own party is that they have little in common with members of the other party. Why do people ‘lean’ toward a party? For independents who lean toward a party, the belief that the other party’s policies are harmful is the most frequently cited reason for their partisan leaning. Nearly six-in-ten Republican-leaning independents (58%) and Democratic leaners (57%) say a major reason for leaning to the Republican and Democratic parties, respectively, is a feeling that the other party’s policies are harmful for the country. Smaller shares (42% of Republican leaners, 34% of Democratic leaners) cite the positive impact of the policies of the party to which they lean. Republican and Democratic leaners also were asked to consider the reasons they do not identify with the party they lean toward. Currently, Republican leaners are more likely than Democratic leaners to say they are frustrated with their party’s leadership (44% vs. 38%). Still, the share of Republican leaners who cite frustration with GOP leaders as a major reason for not identifying as a Republican has ticked down since 2016 (from 52% to 44%). By contrast, more Democratic-leaning independents cite frustrations with Democratic leaders as a major reason they do not identify as Democrats than did so two years ago, when the party held the White House (38% now, 28% then). 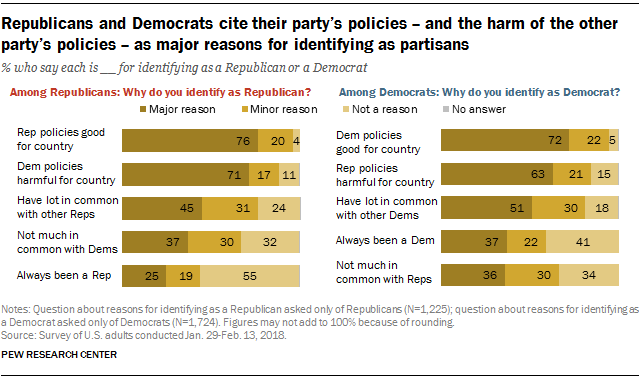 Correction: A previous version of this post misstated the percentages of Democrats who said that major reasons for identifying as Democrats were longtime loyalty and having little in common with members of the other party, respectively (the findings in the accompanying graphic were correct).